UPDATE: I worked with Mike Pollock himself to make a few additions and corrections to the article, I apologize for the mistakes previously present. Yes, you may have not realized it, but today (as of typing, it’s already the 16th in other time zones) marks the 10th anniversary of not just Shadow the Hedgehog (on GameCube, Xbox, and PlayStation 2) and Sonic Rush’s release on DS in North America, but these were the very first games where the longest-running English voice actor in the entire franchise first joined the games themselves. He’s done other voices in the Sonic series as well. In Sonic X, he was also the voice of Ella, as well as the voice of Gerald Robotnik in both Sonic X and in Shadow the Hedgehog. 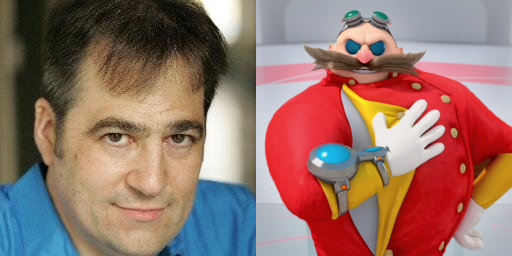 In Sonic Rush he also voiced Eggman Nega. Most recently in Sonic Boom, he voices as both Fastidious Beaver and Mayor Fink. But did you know he also voices characters outside the Sonic franchise? Give his Behind The Voice Actors page a look, you might be surprised by some of the other characters he’s voiced over the years! Which reminds me, what a very interesting coincidence that Sonic’s twitter was taken over by a certain mustached man just back on Friday, with Mike Pollock behind the mic (ahem) and everything (I even saved the avatar, here it is at full size). Wonder if Sega caught that also. Well, I wish you Mike Pollock a wonderful 10th anniversary, as well to all the other 4Kids voice actors even if they’re no longer part of the series. Here’s to 10 more years in the franchise and beyond! As Jet Set Radio will see its first release onto the digital marketplace in a few short days (PSN+ users, you lucky gits), this week’s Mash-Up Monday is entirely dedicated to the man responsible behind most of JSR‘s delicious soundtrack. You may also recognize his work in Sonic Rush as well! Yes, this week, we’ll be looking into mash-ups involving the music of the one and only Hideki Naganuma! We got a total of five mash-ups to celebrate his work! First up is a mash-up by Seenik09, comprised of Naganuma’s Teknopathic from Jet Set Radio Future and something I’m sure you all miss dearly. Put your slam jams together for SlamnoJamthetic! Looking for a new venture in music? I got what u need right here. 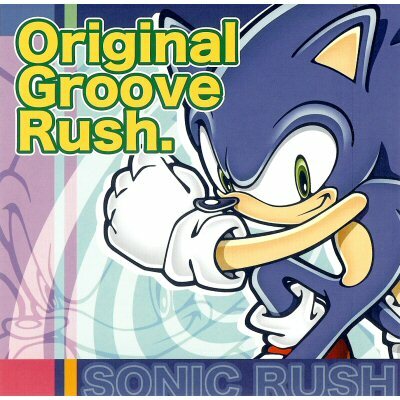 Both Sonic Rush and Sonic Rush Adventure soundtracks are now available on iTunes so you can listen to these awesome tunes back 2 back! Both albums are $9.99 (U.S. Dollars) each with individual songs being 99 cents. But with over 40 tracks per album, you’d have to be crazy to not buy the whole thing. Momma wasn’t raisin’ me up to be foolish with my money. So get edgy and pick up these awesome albums cuz it’s a new day for Sonic tunes! News is slow at the moment, so it’s time for another edition of Ebay Watch. Back in the early 90’s toy developers Tomy released alot of Sonic merchandise to fill the young fans playtime when away from the awesome Sonic video game titles. One piece of merchandise Tomy released was a Sonic edition of it’s then popular Char-G remote control cars. What was so special about these were that they could be recharged in about 45 seconds from the remote handset and when driving them around you could make them spin, flash the headlights and do wheelie stunts. Doesn’t sound like much now but these were pretty cool back in the day and having a Sonic one made you even cooler. If you’d like one of these very rare pieces of merchandise you can bid for it on eBay here. Someone is amusingly enough selling an almost empty Sonic Rush box, I say almost empty due to the fact there is no game card and just a manual inside. Even more amusing, one person so far has actually bidded on this. Some crazy people out there on eBay. You can check this out here. There was a time when our blue buddy was content to wear cheap red knockoffs, but that all changed with ‘Sonic Adventure 2’ when he developed a lust for ‘Soap Scorchers’, and then in ‘Sonic Riders’ when he wore grungy skater boots. 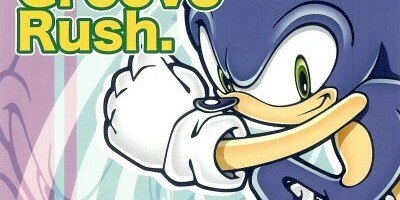 So what now, well lately it seems Sonic gets a ‘Rush’ from wearing Converse All Stars. Get it? Sonic to do a Mario? Gaming website Kikizo Games has recently had a chat with a few of the top dogs of SONICTEAM, and revealed a few tidbits of an interview that will be posted later today. Akinori Nishiyama and Takashi Yuda, the brains behind Sonic Rush and the upcoming Sonic Riders respectively, spoke openly to the website about 2D games coexisting with 3D adventures, and on more Sonic spinoffs to come. “I think 2D games would be preferable for many users. I believe that in 2D games, say for example shooting games, you have to be careful of the slightest space on the screen and think in terms of how many pixels of space you have to manoeuvre. Continue reading Sonic to do a Mario? Today, SEGA Europe announced when the next three Sonic the Hedgehog titles are due for release in our continent. The gun-toting Shadow the Hedgehog has been given a release date of 25th November, as has the blue blur’s DS debut, Sonic Rush, making for a bit of a Sonic day in Europe. For more information on Shadow the Hedgehog, click here and for all the latest on Sonic Rush simply click here. As for when you may expect to play Sonic CD and Sonic the Fighters via Sonic Gems Collection, the new compilation will arrive in Europe at a much earlier date of 30th September. Read all about it here. 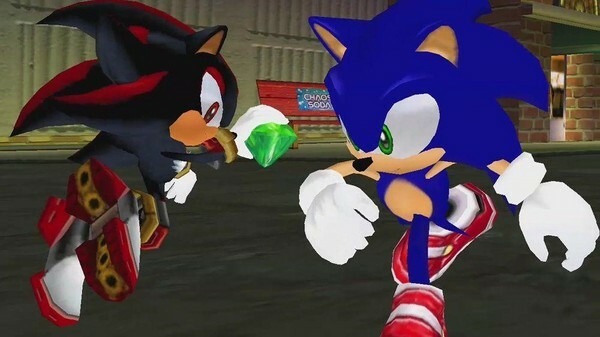 According to our sources, Sonic Gems Collection was just released today (17th August) in the US, with Shadow the Hedgehog also getting a November release and Sonic Rush a tentative ‘Fall 05’ slate across the pond. Let us know what you think of Gems in the comments. Everyone’s favourite Ferrari fanatic, Yuji Naka, will be attending a European Games Convention, held in Leipzig, Germany. SEGA-Europe’s German website has revealed details of his special appearance during two days of the event. As new titles have been suddenly revealed at E3, Sonic Team have updated their website to reflect this too. Being E3, this is an unusually large update, unfortunately for English speaking fans close to all of the content is in Japanese and Flash, so Babel Fish cant help this time! The first of the updates include the long overdue Japanese website for Shadow the Hedgehog. The website contains new movies and a few new screens, whilst confirms the game will be 1-2 player, no release date was specified. 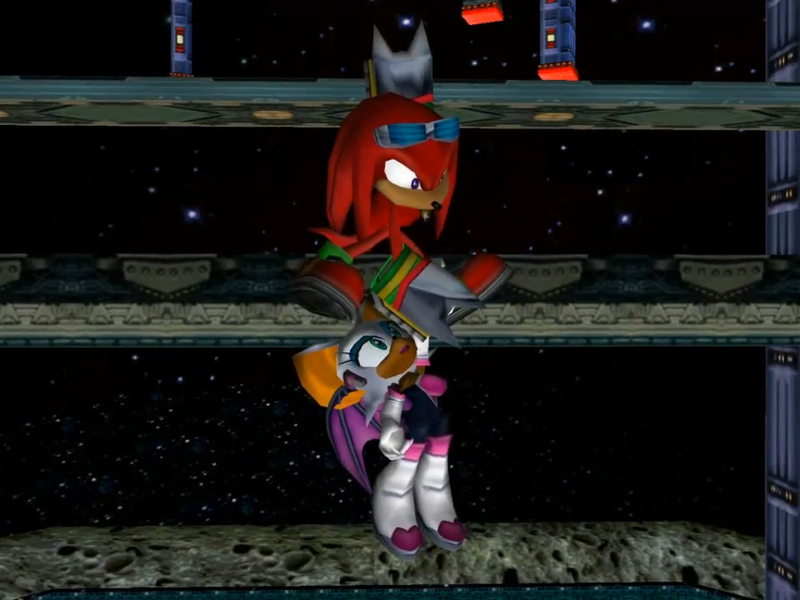 The movie begins with Shadow loading a weapon before using Chaos Control to fly through a cityscape and Chaos Blast to attack some enemies. 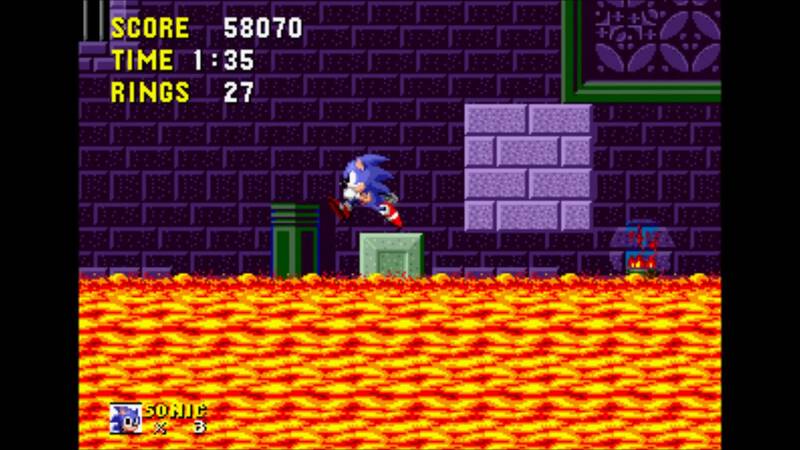 Some new landscapes were visible in the movie as well as Sonic rendered in the games alternate style. Sonic Rush, then. As with Sonic Gems Collection, this game was already being banded about well before SEGA could talk about it. They should really guard their secrets more often. There was talk that this was going to be an all new racing game featuring Sonic and co. But this turns out to be false, instead a rather new way of playing your classic 2D platformer. The name threw many fansites off the mark concerning genre, as many rumours were dead certain that a racing game was in the works. Contrary to popular belief though, this isn’t your racing game, but a whole new take on the Sonic platformer. 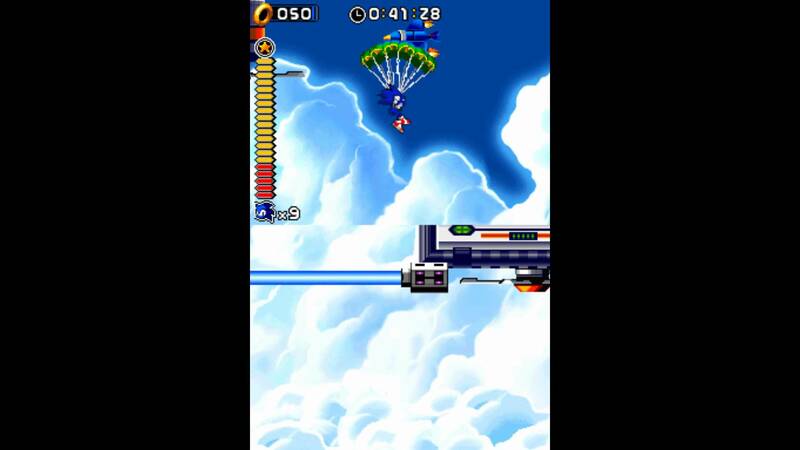 A 2D Sonic game, using 3D models, that uses both of the NDS’ screens to give a larger perspective of the gaming field. It’s a very cool idea that appears to be being put to good use judging by these first snapshots we have of the game. The graphics don’t appear to be up to the proper standard, but assuming we know our Sonic Teams, Naka and co are simply trying to make the gameplay as solid as possible before touching up the graphics. 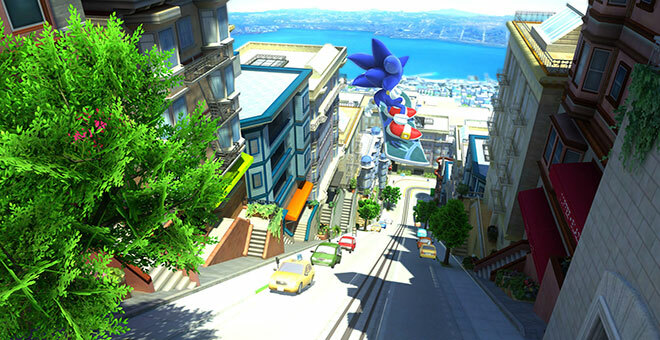 The level design, although it’s folly to judge base on five screenshots, do look nice however – the backdrops look like a very gorgeous blend between Sonic the Hedgehog 3 and Sonic Advance style scenery and styles, with levels you could call Hydrocity, with the fourth image above reminding us all about the level design of Carnival Night Zone. The fifth screen, while bearing resemblence to Desert Palace and Sandopolis, is a great sneak peek at the potential for many alternate routes in this game. The screens certainly show a promising game, with Sonic grinding up a vine and double-screened loops shown. Which leaves just a few questions; mostly concerning that purple character that’s posing next to Sonic. Well, we can reveal that her name is Blaze. Blaze the Cat. Blaze is the queen of another world, and protector of the “Sol Emeralds”. Much like the Chaos Emeralds, these Sol Emeralds are quite the dangerous tool if in the wrong hands. She’s also a bit nippy on the old legs, assumedly. Sonic Rush takes a nice and simple route regarding character control. At present, only Sonic and Blaze have been confirmed as playable characters. This is a somewhat refreshing move by Sonic Team; we were getting worried that every single Sonic game would have to have Tails, Knuckles, Amy, Shadow, Espio, Cream and their mothers all join in on the action. 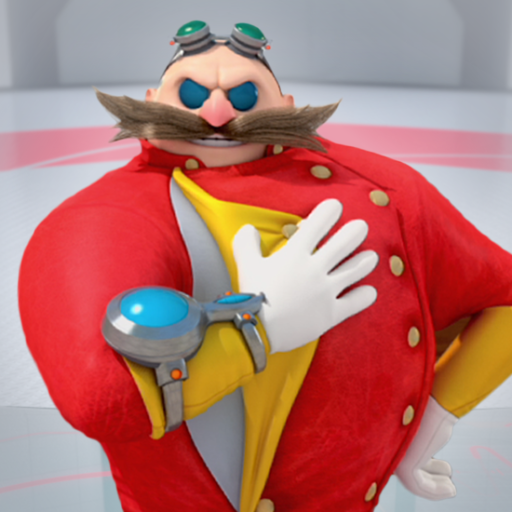 Given how Sonic Team love characters so much (especially making new ones), we have to say we’re quite glad that the focus is solely on two characters (and undoubtedly, Eggman). Let Sonic be the star of the show for once. Having said that, Sonic Adventure 2’s early trailers merely played out Sonic, Knuckles and Eggman as potential playable characters, and then look what happened. Keep it simple, Yuji, we’ll love you for it. All in all, we’re quite chuffed and, shall we say, excited about this one, despite the touch-ups required for the graphics. The touch screen will apparently be used for play, although how this will work out is yet to be seen. We do know that Naka-san specified that a part of the E3 2004 Technical Demo (remember, the one where you\’re rubbing the bottom screen to make Sonic run faster) will be incorporated into Sonic Rush, so perhaps we will be seeing this in a Special Stage of some kind. A brand new Sonic adventure, using touch screen, double-screened, lush backdrops and scenery, and only two characters? Slap us up some of that classic innovative design we’ve been missing for oh so long, Yuji and co, and you’ll have us biting. Once again another entry and scarce details appears in the US Patent listings, this time Sonic Rush. Late last month it appears SEGA have registered the title to another Sonic game to be unveiled at E3 later this month, similar to when Sonic Gems Collection was registered not long ago. Unlike the SGC entry, unfortunately no logo was supplied with the entry. Such news revives waves or rumors from last months ‘Sonic R Extreme’ sightings in upcoming release listings in the US video game retailer chain, Game Crazy. Whether this is indeed a Sonic R sequel or the name of the upcoming Sonic DS title is currently unknown, however many believe the answer will be revealed at the E3 expo later this month. Thanks to grap3fruitman of SCARZ for the info.